If you're anything like me, than you enjoy celebrating your pet's birthdays. I also like to celebrate "Gotcha Day," which is the day I brought my two cats, Mona Marie and Elvis, home from the animal shelter. Coincidently, Bodhi Bear came home on the exact same date as the cats, albeit 12 years later. Every year, I let my animal family know how much I love them by celebrating these important milestones with them. Bodhi likes to celebrate with his friends. Mona and Elvis prefer low-key affairs with cat nip, special treats and ear scratches. This year, I threw Bodhi Bear two parties to celebrate his 3rd Birthday because he has a lot friends. 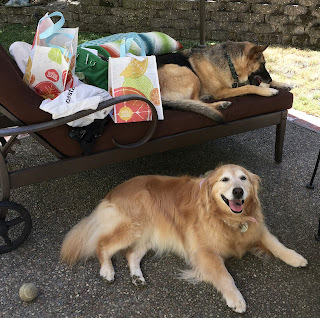 Bodhi invited some of his girlfriends to the first of two Birthday Parties: Sabrina Renee the Golden Retriever; Gigi and Ruby, the King Charles Cavaliers; and Greta and Tonksky, the German Shepherds. Bodhi is quite a popular pup with the ladies. Sabrina Renee's mom baked these Pupcakes especially for Bodhi's 3rd Birthday party. As you can imagine, the pupcakes disappeared quickly. Now that I think about it, so did the cupcakes! Bodhi's birthday party, part duex, happened the weekend after his actually birthday. He wanted to celebrate with his dear friends, Eli and Harvey. The 3 dogs together are affectionately known as "The Keesateers." My friend, Sharon Hill, is an event planner (www.sharonhillevents.com) who loves to throw birthday parties for her Golden Retrievers. First she threw parties for Abby, who is now In Spirit. Her current Golden, Sabrina Renee, recently celebrated her 10th Birthday in my backyard with a few close friends. Bodhi enjoyed having his friends around and eating cake. He especially enjoyed the "Hot Dog Drop!" In this video, Sabrina Renee enjoys unwrapping her many gifts with a little help from her friends. Keep watching to see Sabrina's gifts. Sabrina shows off her gifts while Greta the Shepard eats a bone. Join the party! In this video, Bodhi, Greta the Shepherd and Birthday Girl, Sabrina Renee enjoy eating birthday cake. Do you celebrate your pet's birthdays or Gotcha days? If so, I'd love to hear what you like to do for your family.